When the dust settles at the scene of a collision, an all-too familiar series of events unfolds. Drivers and passengers exit respective vehicles and initiate rudimentary damage assessments. Emergency authorities receive hurried phone calls from concerned witnesses, while the pain of injury takes hold. Traffic begins to accommodate for a new obstruction. Drivers dig through glove compartments to locate insurance cards. This familiar scene, however, may soon face dramatic alteration. The litigation process subsequent to a motor vehicle collision is built largely upon a foundation that assumes liability will be shouldered by the negligent human operator, along with her liability insurer. This basic assumption now faces serious skepticism from the world of automation. The automated vehicle (“AV”), or driverless car, is poised to disrupt and upend the manner in which litigators, insurers, consumers, and countless others respond to, and otherwise interact with, motor vehicle collisions. Long regarded as the fodder of futurists1—more science fiction2 pipe-dream than legitimate possibility—autonomous vehicle technology is now clearly visible on the horizon. The questions posed by the advent of AVs attack the very basis of motor vehicle collision litigation. As it stands, many jurisdictions are grappling with precisely how to regulate and legislate around the adoption of AVs and AV technology. Certainly, this is no small task; even the most basic facets of motor vehicle litigation are vulnerable to change as AVs move out of research centers and onto roadways. The most routine issues prove difficult to address when a program, as opposed to a person, is guiding the vehicle. If the operator is not human—if the operator is a computer program, or the operator is the author of a computer program—who is negligent? Who will shoulder the liability? Can the boundaries of personal injury liability circumscribe the offices of computer engineers in Silicon Valley? With such wide ranging repercussions, basic questions underlying the litigation of collisions merit newfound attention. 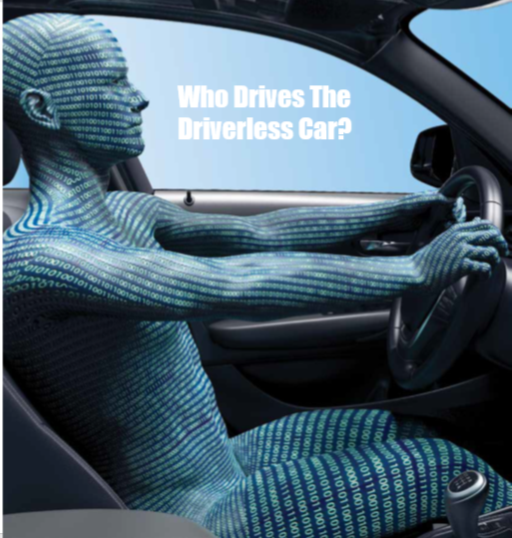 Litigators are forced to first ask, who drives the driverless car? Possibly to no surprise, the answer is a bit precarious. Functionally speaking, an AV is driven by a computer program along with an array of complicated technical gadgetry.3 Yet, legally speaking, the answer varies, and depends largely on state statutes. In states at the forefront of AV regulation, humans remain, by and large, the legally-defined operators of these vehicles.4 Under most statutory definitions, an individual becomes thedriver of an AV at the moment they cause the AV to begin operation. In California, the operator of an AV is defined as “the person who is seated in the driver’s seat, or, if there is no person in the driver’s seat, causes the autonomous technology to engage.”5 Similarly, Florida deems an individual the operator of an AV when she “causes the vehicle’s autonomous technology to engage, regardless of whether the person is physically present in the vehicle while the vehicle is operating in autonomous mode.”6 This is, of course, not the only approach. In its AV legislative package, Michigan expanded its definition of the term “operating” as it relates to vehicles to include “being in actual physical control of a vehicle regardless of whether or not the person is licensed under this act as an operator.”7 Still, the vast majority of states, Wisconsin included, have yet to implement any scheme to accommodate for AVs on the roadways. Although AV technology nears large-scale adoption, states have, by-and-large, resisted statutory accommodation for such adoption. This resistance is reflected not only in statutory definitions for AV operators, but also in how States intend to assign liability for vehicle collisions wherein the at-fault vehicle is an AV. That is to say, uncertainty surrounding the assignment of liability for at-fault AVs abounds. So far, this statutory gap has not met serious practical pitfalls, ostensibly due to the incredibly low rate of AV collisions.8 Yet, a shift in the understanding of liability for motor vehicle collisions may be underway. In traditional motor vehicles collisions, manufacturers evade litigation because the negligence of the driver is most often considered the cause of the collision. In other words, it is not a defect with the car that causes collisions, traditionally it is the negligent operator. In circumstances in which an operator reasonably engages autonomous driving technology, only to have the vehicle collide into another vehicle, there may be no at-fault driver involved at all. Removing human control of driving operations may eliminate the prospect of operator negligence altogether, rendering manufacturers more exposed to liability. The prospect of reaching the deep pockets of manufacturers may peak the attention of the plaintiff’s bar. Existing tort frameworks governing the sale of consumer products could wed the driverless car manufacturer to the driverless car collision. Legal scholars and insurance experts contend that, in their current form, the doctrines of negligence, strict liability, misrepresentation, and breach of warranty could all theoretically operate to hold an AV manufacturer liable for injury resulting from a truly driverless car collision.9,10 Reaching such a conclusion is not difficult if one simply considers the AV to be just another consumer product. Indeed, if, for example, AV navigation software directed an AV into oncoming traffic, it is easy to imagine that the injured parties could attempt to bring a claim under Wisconsin’s Product liability statute, Wis. Stat. § 895.047. The existence of a defect, a corresponding unreasonable degree of danger, and causation would presumably all attach to a vehicle that independently drove itself into oncoming traffic. So long as the relevant navigation software went unchanged from the point of sale, this theoretical product liability claim would stand a fighting chance against the manufacturer. Existing tort doctrines notwithstanding, current proposals for AV liability frameworks actually limit manufacturer risk. The California Department of Motor Vehicles (“CDMV”) published draft regulations on consumer AVs in December of 2015. These regulations offer insight into how regulators around the country may respond to the full-scale implementation of AVs. The regulations reflected a slight shift away from traditional notions of liability in motor vehicle collisions. On one hand, the CDMV draft regulations require manufacturers to offer evidence of their ability to pay for personal injuries arising from their vehicles— suggesting a transition away from operator liability and towards manufacturer liability. Yet, these draft regulations also impose new duties upon operators of AVs, deeming the operator responsible for the vehicle at all times, and requiring that an operator be capable of taking over the vehicle in the event the AV technology fails11. This latter requirement suggests that the onus of any collision may remain on the operator as opposed to the manufacturer. Other, more radical, shifts in the frameworks for collision liability are also under review by policy makers. For example, some contend that the advent of AVs could bring about the end to specialized automobile insurance.12 As error-prone human decision making is replaced by the cold calculation of a computer program, many believe that the rate of collisions will drop sharply. A corresponding reduction in risk for injury could very well minimize incentives for such specialized insurance to the extent that it is rendered unnecessary. Before automobile insurance dissolves altogether, some states are experimenting with express rejection of manufacturer liability for AV collisions.13 Others recognize that contract law may offer additional shields to collision liability. As major auto-industry players team up with ride-sharing apps such as Lyft it may be the case that the autonomous vehicles are utilized more routinely as a subscription-based service than an owned consumer product. Through such an arrangement, consumers would be able to request AV transportation through a third party. By reconfiguring terms of service agreements, insurers and manufactures alike may find opportunity to limit recovery for injured passengers.14 Finally, there is even precedent to suggest that AV manufacturer liability may be expressly preempted by way of AV manufacturer compliance with relevant federal safety regulations.15 Ultimately there are many policy prescriptions being offered and considered that shield manufacturers from liability that may otherwise attach absent traditional vehicle operator negligence. From the perspective of the automobile industry, AVs are already beyond the moment of rubber meeting road. Even though AVs are still being tested and refined, it Is not hard to recognize that large-scale adoption is just around the bend. The Google Self-Driving Car Project reports16 over 1.5 million miles traveled by their fleet of AVs. Other, more traditional, auto industry players are making related investments. General Motors recently poured $500 million into the ride-sharing network Lyft, with an eye towards developing a driverless fleet of Chevy Bolts.17 Simultaneously, Ford is working in tandem with Google to direct a public policy coalition aimed at hastening the adoption of AV-friendly regulation and legislation.18 Even the United States Government is welcoming the new technology with open arms. At a press conference in January, the Obama Administration celebrated $4 billion that it set aside for AV investment in the White House budget; the White House also indicated that it would hasten the arrival of federal guidelines associated with AVs.19 Even the trucking industry appears on the precipice of AV integration. Fifteen former Google employees recently launched Otto20, a new venture geared towards the development automated semi-trucks. The AV is likely to alter plaintiff-side litigation. Although it is not immediately clear when this will take place, both the likely reduction in automobile collisions, along with reimagined liability framework for manufacturers pose real implications for litigators. Although barriers to market entry still exist23, the wise attorney will remain abreast of these changes as they come barreling down the road. See Norman Bel Geddes, Magic Motorways, 1939. See Minority Report (20th Century Fox 2002). RAND Corporation, Autonomous Vehicle Technology A Guide for Policymakers (2016). Mich. Comp. Laws Serv. § 257.35a (b). RAND Corporation, Autonomous Vehicle Technology A Guide for Policymakers, at 115 (2016). RAND Corporation, Autonomous Vehicle Technology A Guide for Policymakers, at 134 (2016). Geier v. American Honda Motor Co., 529 U.S. 861 (2000). Google Self Driving Car Project, https://www.google. com/selfdrivingcar/ (last visited June 3, 2016). RAND Corporation, Autonomous Vehicle Technology A Guide for Policymakers, at 4 (2016). Not the least of which is the Geneva Convention on Road Traffic. Although the United States is not a party to the convention, its language may present a hurdle to AV adoption globally. This convention establishes that “[e]very moving vehicle or combination of vehicles shall have a [person] driver,” and “[e]very driver shall at all times be able to control his vehicle.” Article 8, Section 1, 5. Convention on Road Traffic, Geneva, Sept. 19, 1949.